Let this scribe make a confession: He is no authority upon the subject – ‘Life and Events of Syed Hussain Sharafuddin Shahwilayat’. He is neither a historian nor a scholar chronicler or a very strong devotee of any cult or tradition. This article is simply based upon some folk stories, magazines, books, stray observations, cluttered thoughts and last but not least – some figments of unintended imagination. The reader is free to accept, reject, condemn and challenge any content of it at his own standards of merit and knowledge. Before I describe the brief history of the Saint Sharafuddin Shahwilayat I feel it would be justified if I share few thoughts about Tasawwuf which could be simply described as the traditional Islamic science of self-improvement and spirituality. It is related to Sufism and defines our relationship with Allah. According to Moulana Ashraf Ali Thanwi – Many people have misunderstandings about tasawwuf. Many think that it is something beyond the Qur’an and Sunnah. Errant Sufis as well as the superficial ulema, although on the opposite ends of the spectrum, are together in holding this mistaken notion. Consequently the first group has shunned the Qur’an and Hadith while the second group has shunned tasawwuf. Actually, although the term tasawwuf, like many other religious terms in use today, evolved later, the discipline is very much part of the Shariah. The department of the Shariah relating to external deeds like salat and zakat is called fiqh while the one dealing with the internal feelings and states of the heart is called tasawwuf. Both are commanded in the Qur’an. Thus while commanding Salat and Zakat, the Qur’an also commands gratefulness and love of Allah and condemns the evil of pride and vanity. Similarly, in the books of hadith, along with the chapters on Ibadat, trade and commerce, marriage and divorce, are to be found the chapters on riya’ (show off) takabbur, akhlaq, etc. These commands are as much a mandatory requirement as the ones dealing with external deeds. Its focus is tahzeebe akhlaq or the adornment of character; its motive is the attainment of Divine pleasure; its method is total obedience to the commands of the Shariah. Sufism traces its origin precepts to Hazarat Mohammed (PBUH) through his cousin and son-in-law, first Imam and 4th Caliph of Islam Hazrat Ali (KAW). There is only one connection ‘Naqshbandiya’ which claims its origin to Hazrat Abu Bakar, the 1st Caliph of Islam. According to great Iranian scholar Abu Rayhan Albiruni, the ‘Sufi’ word is derived from the Greek word ‘Sofia’ meaning wisdom. The Sufi practiced asceticism and shunned the pomp and pursuit of pleasure flouted by Umayyad, Abbasi, Khilji and Toughlaq dynasties. They never preferred the company of feudal aristocrats for pleasure. Today the picture of gun-totting terrorists, bombs and preachers-of-hate is in absolute contrast to the cool, inspiring, loving, smiling and reassuring images that conjure up when we remember Nund Reshi, Lalleshwar or Dehat Bibi, the saints of Kashmir Valley. (The eyes met and I gave up all the symbols of faith, my beloved spoke some enchanted words and made me a bride). You instantly knew the creator of these words – Ameer Khusrau. Tasawwuf is the soul of Islam. Its function is to purify the heart from the lowly bestial attributes of lust, calamities of the tongue, anger, malice, jealousy, love of the world, love of fame, niggardliness, greed, ostentation, vanity, deception, etc. At the same time it aims at the adornment of the heart with the lofty attributes of repentance, perseverance and. In India the concept of Tasawwuf is followed and practiced in different forms and different schools. They are not radically different from each and a subtle nuance of names categorizes them as beautiful branches of the same spiritual plant that shades over the schism that prevails in basics of belief. I am giving below the most popular schools of Tasawwuf. The Chishtiyya order emerged out of Central Asia and Persia. The first saint was Abu Ishaq Shami (d.940–41 A.D.) establishing the Chishti order in Chisti Sharif within Afghanistan. The notable saint Moinuddin Chisti (d. 1236 A.D.) has championed this order within India, making it one of the largest orders in India today. Scholars also mentioned that he had been a part-time disciple of Abu Najib Suhrawardi. Khwaja Moiuddin Chishti was originally from Sistan (eastern Iran, southwest Afghanistan) and grew up as a well traveled scholar to Central Asia, Middle East, and South Asia. [He reached Delhi in 1193 A.D. during the end of Ghurid reign, then shortly settled in Ajmer-Rajasthan when the Delhi Sultanate formed. Moinuddin Chishti’s Sufi and social welfare activities dubbed Ajmer the “nucleus for the Islamization of central and southern India.” The Chishti order formed KHANQAH to reach the local communities, thus helping Islam spread with charity work. Islam in India grew with the efforts of dervishes, not with violent bloodshed or forced conversion. Until this day, both Muslims and non-Muslims visit the famous tomb of Moinuddin Chishti; it has become even a popular tourist and pilgrimage destination. Jalaluddin Muhammad Akbar (d. 1605 A.D.), the 3rd Mughal ruler frequented Ajmer as a pilgrim, setting a tradition for his constituents. Successors of Khwaja Moinudden Chishti include eight additional saints; together, these names are considered the big eight of the medieval Chishtiyya order. Moinuddin Chisti (d. AD 1233 in Ajmer, India), Qutubuddin Bakhtiar Kaki (d. AD 1236 in Delhi, India), Fariduddin Ganjshakar (d. AD 1265 in Pakpattan,Pakistan), Nizamuddin Auliya (d. AD 1335 in Delhi), Nasiruddin Chiragh Dehalvi, Bande Nawaz (d. AD 1422 in Gulbarga, India), Akhi Siraj Aaine Hind (d. 1357 in Bengal India, Alaul Haq Pandavi and Ashraf Jahangir Semnani (d. AD 1386, Kichaucha India). The founder of this order was Abdul-Wahir Abu Najib as-Suhrawardi (d. 1168 A.D.). He was actually a disciple of Ahmed Ghazali. The teachings of Ahmad Ghazali led to the formation of this order. This order was prominent in medieval Iran prior to Persian migrations into India during the Mongol Invasion. Consequently, it was Abu Najib as-Suhrawardi’s nephew that helped bring the Suhrawardiyyah to mainstream awareness. The origin of this order can be traced back to Khwaja Ya‘qub Yusuf al-Hamadani (d. 1390 A.D. ), who lived in Central Asia. It was later organized by Bahauddin Naqshband (b. 1318–1389 A.D.) of Tajik and Turkic background. He is widely referred to as the founder of the Naqshbandi order. Khwaja Muhammad al-Baqi Billah Berang (d. 1603 A.D.) introduced the Naqshbandiyyah to India. This order was particularly popular Mughal elites due to ancestral links to the founder, Khawja al-Hamadani. Babur, the founder of the Mughal dynasty in 1526 A.D., was already initiated in the Naqshbandi order prior to conquering India. This royal affiliation gave considerable impetus to the order. The Qadiriyyah order was founded by Abdul Qadir Gilani who was originally from Iran (d. 1166 A.D.). [ It is popular among the Muslims of South India. As a widespread order, the Qadiriyyah had a prominent sheikh in India. Muhammad Mayan Mir (d. 1635 A.D.) was a famous scholar known for significant non-Muslim tolerance and community service work. Worlds largest religious organisation Dawate-E-Islami also belongs to the Qadiriyyah order whose founder was Moulana Ilyas Qadri. Sufism helped the assimilation of the Afghani Delhi Sultanate rulers within mainstream society. By building a syncretic medieval culture tolerant and appreciative of non-Muslims, they contributed to the growth of stability, vernacular literature, and devotional music in India. Literature related to monotheism and the Bhakti movement also formed syncretic influences in history during the Sultanate period. Sufi scholars traveling from all over continental Asia were instrumental in the social, economic, and philosophic development of India. Besides preaching in major cities and centers of intellectual thoughts, Sufis reached out to poor and marginalized rural communities and preached in local dialects such as Urdu, Sindhi, Panjabi versus Persian, Turkish, and Arabic. Their teachings of humanity, love for God and Prophet (PBUH) continue to be surrounded by mystical tales and folk songs today. Sufis were firm in abstaining from religious and communal conflict and strived to be peaceful elements of civil society. Furthermore, it is the attitude of accommodation, adaptation, piety, and charisma that continues to help Sufism remain as a pillar of mystical Islam in India. To begin with, very few history books are available in India now where he is mentioned in any form in relation to larger SUFI Movement of India. Perhaps, his father was shy of éclat and preferred the ascetic life of Amroha which was often referred as Qasba Azizpore in those days. He didn’t make Delhi or any royal city of his final abode. There is no provision of SAJJADA NASHEENI in his hierarchy that is so common and necessary in Sufi Schools. One can safely conclude that he had a limited spiritual domain and he loved the simple life of towns and villages. He was the son of Mira Ali Buzurg who was a learned scholar. His mother’s name was ‘Umme Habeeba’ and she was the daughter of Syed Abdul Moueed Ali. Syed Jalaluddin Haider Surkh Posh, the famous saint of earlier Muslim Indian Sultanete, was the real brother of Bibi Umme Habiba. They migrated to the city of Sauda in Syria and from there to ‘Wasit’ a hamlet in Iraq. This town was established at the bank of River Dajla by Hajjaj Bin Yussuf in 83 AH. After a lapse of considerable time new designs of agriculture and water resources diverted water to other canals and waterways and it resulted in scarcity of water in the town. Political and Administrative frictions compounded and made life unbearable for the descending generations of Syeds of Abbasid Kingdom. Syed Mira Ali Buzurg had three sons and one daughter. Feeble- thin, devoid of cheer. Or see the spring showers. In fire of sad and sorrows. Another’s sorrow and grief I can’t see. Frenzy of beauty is naught to me. Cries for water and food, I can’t see. A statement issued by the Gujarat government had said that Jaswant Singh’s book questions the role of Sardar Patel during the partition of India as well as his patriotic spirit and charged him for trying to defame Patel by distorting facts. IT IS the story of Jaswant Singh. His book titled “Jinnah, India, Independence and Partition” was released on August 17, 2009 and banned in Gujarat with immediate effect a Bharatiya Janata Party-ruled state. He was given a cold shoulder and finally shown the door in the initial storm of political hara-kiri. Let us not discuss here about the very open arms that this party always held out to Salman Rushdie and Taslima Nasreen in the name of freedom of speech. A statement issued by the Gujarat government had said that Jaswant Singh’s book questions the role of Sardar Patel during the partition of India as well as his patriotic spirit and charged him for trying to defame Patel by distorting historical facts. In his intuitive moments of sincerity and honesty the ex-army men and ex-foreign minister of India Jaswant Singh has emphatically blamed Jawaharlal Nehru, Sardar Patel and the Congress rather than Quaid-i-Azam Muhammad Ali Jinnah for partition of India. Ihe paid his tributes to Jinnah in the following words “ the epic journey of Jinnah from being the ambassador of Hindu-Muslim unity, the liberal constitutionalist and Indian nationalist to the Quaid-e-Azam of Pakistan”. 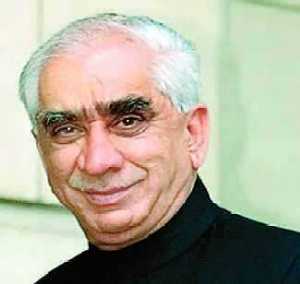 Jaswant Singh set no inhibitions in declaring in an interview with Karan Thapar on television channel. And here are his more than million billion $ comments on the plight of the Indian Muslims today: “Look into the eyes of the Muslims that live in India and if you truly see through the pain in which they live in to [the] land which they belong; we treat them as aliens”. Pearls of wisdom from the honest man“…He (Jinnah) created something out of nothing and single-handedly stood against the might of the Congress and the British who didn’t really like him…Gandhi himself called Jinnah a great Indian. Why don’t we recognise that? Why don’t we see (and try to understand) why he called him that?…I admire certain aspects of his personality; his determination and the will to rise. He was a self-made man. Mahatma Gandhi was the son of a Diwan. All these (people) – Nehru and others – were born to wealth and position. Jinnah created for himself a position. He carved in Bombay a position for himself. He was so poor that he had to walk to work…He told one of his biographers that there was always room at the top but no lift…and he never sought a lift”. According to Jaswant Singh : Indian leaders had not only misunderstood Jinnah but made a demon out of him. According to him the demonisation of Jinnah was a direct result of the trauma of partition. So Mr. Bhagwat and Mr. Gadkari, let us know if Jaswant Singh has disown any of his statements ? If your answer is Yes, please show us. If your answer is a singular No, God bless you in whatever form you worship. You are making compromise after compromise. You accepted Advani Ji’s double speak in many on many of faux pas and blunders. The saving grace in Advani Ji’s case is that he did put many Alzheimer kind of excuses in his comments on Kandhar and made a 180 degree turn on Jinnah when caught in the wrong box. Jaswant Singh is made up of a different mettle. Jaswant Singh has come a long way from the deserts of Rajasthan. He had also been rough two wars whilst in service (1962 and 1965) before joining politics. He has served seven terms in Parliament, and, in the BJP-led governments of 1996 and 1998-2004, held charge of six ministries of the Government of India, including External Affairs, Defence and Finance. He is as an authority on Indian foreign policy and national Due credit should be accorded to him for dexterously steering India out of the turbulent diplomatic times in the aftermath of the nuclear tests. Today he is returning on his own terms – only to show you that your party is devoid of any ideology. You need power at the expense of every principle you trumpeted since the birth and rebirth of you communal out-fit. 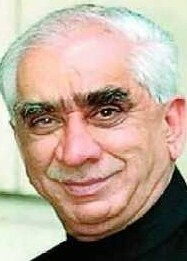 I welcome the honorable comeback of Jaswant Singh. It augurs well for Indian Democracy. Good-bye the divisive philosophy of Golwalker, Hedgware and Shyama !